Barneys Farm are continually pushing the limits of marijuana genetics, improving their selection and breeding processes to create something that is truly breath-taking. Acapulco Gold is the next generation of marijuana. Was chosen from seeds collected in the 1970’s, from the best traditional hash makers in the Mazari Sharif region. The Farm received a gift of these Red River Delta seeds some years ago. When grown out these incredibly beautiful purple and ruby red plants were a revelation. We then crossed it with our Master Kush and created the perfect strain. Bad Azz Kush is a strain which was created by breeding a true Indica which is rich in history dating back to 98 in Los Angeles. Bad Azz originally started life from specially selected breeding by our friends in L.A. over years of careful and persistent work. This strain of Blue Cheese is one of the best and strongest on the market, and is guaranteed to knock your head off. 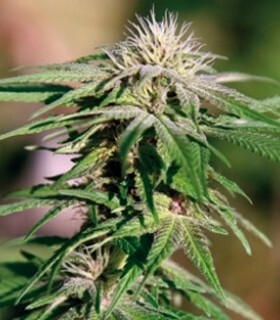 This is an easy to grow strain, which creates an incredible yield of fragrant and tasty buds. The classic BLUE CHEESE™ is now available in an autoflowering variant. This strain is easy to grow and it’s high productivity makes this one of the best autoflowering strains on the market. BLUE MAMMOTH AUTO is the crossing of a Blueberry Skunk crossed with our own Lowryder #1, to give a dependable and all-round performer. This is one of our top autoflowering strains for connoisseurs and home growers. Blending two of the worlds most distinguished strains and reproducing the best characteristics from both these noble genetics was a complex assignment. CBD Blue Shark is an Indica dominant strain created by a cross of Skunk #1 and CBD Enhanced. Blueberry was crossed with the classic Shark Shock and finally bred with our CBD enriched Sativa to give this outstanding result. Is a CBD enriched exotic 3-way fusion, culminating in a 70%/30% Indica dominant strain with a 1:1 CBD-THC ratio. This plant has dynamic growth from the start so the vegetative stage can be kept to a minimum. Barneys Farm and CBD Crew breeders got together to create a champion autoflowering CBD enriched strain, LEMON POTION AUTO™, which is both therapeutic and sensationally tasty. By crossing the long established and superior genetics of both the legendary Alaskan Thunder with the stable and high yielding Dr. Chronic, Chronic Thunder was born. Cookies Kush has quickly become a phenomenon within the cannabis community. This amazing strain was created through crossing our Girl Scout Cookies phenotype with a powerful OG Kush. Crimea Blue was created by crossing the hugely popular, fruitful Blueberry strain with the earthy spiciness of a hardy Crimean Hash plant. With this exclusive crossing, Barneys Farm has created a new flavour sensation. Critical Kush comes from a blend of the famous Critical Mass with our own OG Kush. 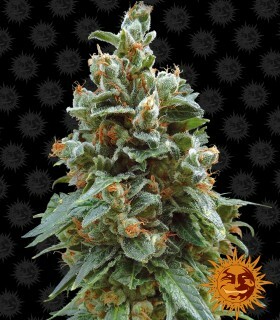 This is an extremely vigorous and powerful Indica plant which yields huge amounts of strong Kush. One of BARNEYS FARM® most popular strains is now available in autoflowering, so say hello to the CRITICAL KUSH AUTO. CRITICAL KUSH™ is now available as a regular strain for connoisseurs in search of the ultimate CRITICAL KUSH™ mother. A strain named in honour of an amazing Cannabis advocate, researcher and author, Dr Lester Grinspoon. This is a pure heirloom Sativa which grows tall and thin. What happens when you mix the legendary G13 with our favourite Hawaiian Sativa? You get a plant with an extraordinary density of flower and resin production. Maintaining our mystical G13 legend by crossing G13 with a classic Skunk#1, was perfect to firstly advance the precious G13 genetic pedigree. Long flowering intense sativa. Honey B like many other high quality sativa strains is a long flowerer. But the time it takes helps the buds fill out and mature fully. The plant will stretch a lot but it can produce very large yields. Is an almost pure Sativa strain, created by crossing our pure landrace Thai Sativa with our Jamaican Hybrid. Is a strain created from a crossing of G13 with a fast flowering ChemDawg 91. This strain has both Indica and Sativa characteristics, and has a fast flowering time of 8-9 weeks, where it grows to a medium height. Is a hardy mould and disease resistant plant that responds well to all growing conditions. It was given its name by the Barney’s crew because of its powerful trippy high. We are over the moon to be able to announce the arrival of our LSD AUTO™. At BARNEYS FARM we strive to bring you the best strains, so with MALANA BOMB AUTO we started with one of the most important plants in Marijuana culture: the Malana Charas. 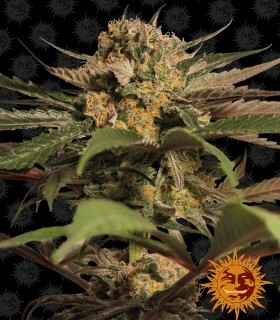 Is the result of a three way strain cross, a combination of Afghani Indica with Hawaiian and Skunk #1. Is the autoflowering version of the legendry New York City Diesel, bred by Soma in the early 1980’s. ORANGE SHERBERT™, a powerful and invigorating Indica dominant hybrid with intoxicating and mouth-watering effects. This is a cross of our famous Stella Blue with our Nepali Kush. The results give a truly beautiful experience, crossing the aroma and punch of each strain. Originates from crossing Peyote Purple and our Legendary Cookies Kush.A large and detailed selection and back-crossing process isolated the very best qualities of both parents into one strain. 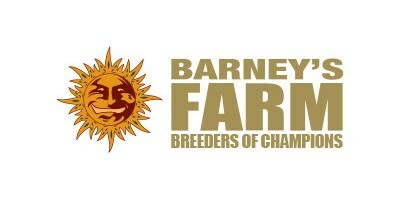 Are you ready for something special from the Barney’s lab? Get ready for PEYOTE CRITICAL LIMITED EDITION™ . It’s an exclusive limited edition pure Indica hybrid, with awesome yield potential and fantastic pest resistance qualities. was created by crossing the Sativa dominant Phantom Cookies with OG Kush, this produced a strain with huge advantages. Brings together the unusual flavours of Afghanistan and North India, and mixes them with the bright tropical tastes of Mexico. Was created by crossing “Barney’s Farm” Sweet Pineapple with our Cheese/Skunk #1 - breeding into this new variety the essence and flavour of these delicious strains. Our world famous PINEAPPLE EXPRESS is now available in an autoflowering variant. PINEAPPLE EXPRESS AUTO is a hardy, fast flowering and easy to grow cannabis plant giving generous yields of heavy buds coated in resin. Is the coming together of the legendary earthy Afghan x Skunk#1 and the spicy Old School Haze. This produced a supreme Sativa dominant hybrid with an extravagant harvest, delicious pineapple flavours together with a heavenly cerebral high. This stunning and highly regarded relative of OG Kush visually defies reality with her breathtaking pink and purple hues. Is a strain for the Indica connoisseurs who love a cerebral high, along with a restful body stone. RED CHERRY BERRY comes from a cross of our best skunk plant with one of its Californian ancestors. Brings together our famous NYC Diesel with the sweet citrus of the Californian Orange Bud plant. The crossing of a Pakistani Kush with a true Brazilian Sativa paved the way for one of our most exotic strains. RED DRAGON gives a distinctive and immediately exotic Sativa high, with a relaxing effect that lasts for hours. Getting our Shiskaberry strain to this stage has been a complex work in progress for years and we are delighted to finally introduce this unique and wonderful strain to our catalog. Is the future of effortless cultivation. This has been created by breeding our pure Indica Afghan Mazari with our advanced Lowryder #1. We are delighted to introduce this brand new Strawberry & Lemon flavoured creation from Barneys Farm. Took the world by storm in the early 2000’s, winning three successive Cannabis Cups. Is now available in an autoflowering strain. BARNEYS FARM original SWEET TOOTH was crossed with the most recent strain from our autoflowering family, but has all the primary elements of SWEET TOOTH running through it. Is an Indica dominant strain that offers tangy Tangerine aromas and flavours, giving an instant relaxing and cerebral high. Has been developed as a treat for lovers of our award winning Coffeshop classic TANGERINE DREAM. The best of both worlds for smokers and growers and a fun plant to grow. Is a true marijuana experience. It starts with strong pungent scent, and finishes with an amazing mind and muscle relaxing high. A good filtration system is recommended when growing this strain. Is the crossing of our BLUE CHEESE with the powerful Original Cheese (Skunk#1 phenotype), created over many generations of selections and back crossing to give this amazing strain. Is the result from generations of backcrossing and selection from a prized Brazilian landrace. In its first Cannabis cup the UTOPIA HAZE took both Cannabis and Sativa cups, and was called the overall favourite of the event. 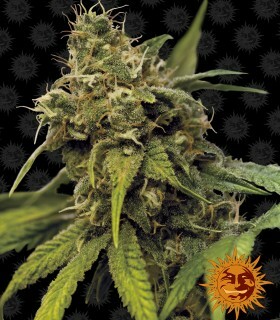 Combines a fast flowering Afghan strain with the unique Kashmir seeds collected by Barneys in the mid-1980s. VANILLA KUSH marries the Indica strength of the best Afghani genetics with the high mountain aromas of the Kashmir valley. We spent some time in the Himalayas and the Malana Valley collecting and carefully selecting the very best genetics from the region. The Malana Charas was selected for its potency and hash giving characteristics. Was created by first crossing Tijuana Sativa with Kerala which created a beautiful Sativa dominant plant, flowering with high levels of cannabinoids.